I often read movie reviews and afterwards wonder why I bothered. The films critics love I usually find dull and the ones they hate, I fall in love with. Of the last three films I watched, I liked two that the critics didn’t like and wasn’t overly impressed with one they raved about. This film starring Drew Barrymore and Justin Long is a cute, funny and honest rom com about a couple struggling with a long distance relationship. I really enjoyed the humour and realistic romance and thought the leads had great chemistry. However, reviews were mixed and it has a 51% rating on Rotten Tomatoes. I think the problem for me was this was over-hyped and I had high expectations. 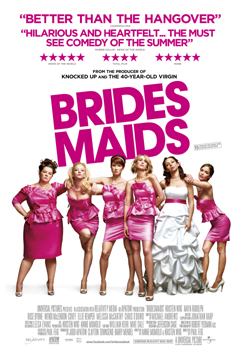 This film is a comedy about a motley crew of bridesmaids starring and written by Kristen Wiig. I found the film funny and honest in places and the second half really picked the film up but parts were totally over-the-top and gross out. However, this film has 90% score on Rotten Tomatoes. This film is a thriller romance about a man who falls for a girl that he’s not supposed to. 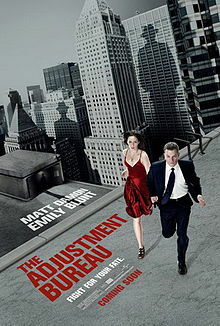 The Adjustment Bureau try to rearrange his life so they won’t be together but he has other plans. I thought this film was smart and pacey with an intriguing premise and I loved the two leads played by Matt Damon and Emily Blunt. I think you like Inception you will enjoy this film. The reviews for this were also mixed with 72% rating on Rotten Tomatoes. So I guess I should read reviews lightly in the future and follow my gut instinct as to whether I’ll enjoy a film or not because we really do all have different tastes. What films did you like that the critics blasted? I don’t really watch movies so I can’t say much to this post. I just gotta hope that my book, which I hope to be turned into a movie, doesn’t get rotten reviews!!!!! no firm title yet, it’s a semi-autobiographical book! in other words, i’m not telling. It’s a real rom-com. And it’s in Scots language. Only Scottish people’ll understand it. Sorry! Haha I’m sure it won’t! Movies and books…they are so subjective. I try to form my own opinion because you just never know. I liked how one book reviewer mentioned how she didn’t like a book she’d read, but it was probably just timing. She gently reminded everyone that while she may not have liked the book, others will. I Thought that very respectful. LOL. I remember saying many times, “How the heck did they review that movie that poorly? !” Unfortunately, my memory is such that I remember exactly zero of the movies I’ve said this following. I’ve only seen one of these, but I def want to check out ‘Going the Distance’, I love Drew Barrymore! I had the exact same opinion on Bridesmaids… I think my expectations were so high that I was disappointed. Something like that, anyway! I expected to LMAO the entire time and it just didn’t happen. Yeah I think it was far too over hyped! I don’t pay attention to the critics. I generally like the indie movies that don’t make it to theatres. I can’t deal wit anything that’s hyped up. I HATED Bridesmaids. I’m not one for that type of comedy any way. The ones that try to hard. I detest Jim Carrey type comedy. Hangover? No, ma’am. Not for me. I watched Hanna a few nights ago and really enjoyed it. Other movies I’ve liked are Juno, Death at a Funeral (the British version), Ira & Abby (which I’m hoping to watch tonight with g/f), and Ghost Town. I wondered what Hanna was like, might check that one out then! I started The Adjustment Bureau last night. Like it so far. I just got really sleepy. (This happens a LOT). Will finish it tonight. That’s true, recommendations are useful! I felt the same way about Bridesmaids, I went in with HUGE expectations and it fell flat. Adjustment Bureau, on the other hand, was enjoyable but at the same time upsetting. I wrote a synopsis 5 years ago that mirrored the plot. To find out it was written decades before was a bit of a sad moment. It’s the “why” of the reviews that mean the most to me ~ WHY did they love it, or hate it? Haha not seen that one but most of his films are poor! If we all liked the same thing it would be way too boring. As for reviews, I think it depends on where the person is from. Every culture is different from the others. Maybe better to find a reviewer that you agree with and only go with their review. As for me, I think I have to be in the right mood. I like a good rom-com every so often and I like action or drama or whatever other times. I love Drew Barrymore, she’s just so cute. Drew Barrymore is an excellent actress. I am in my early 50s and really like all the funny films that Zac Efron is in. He always makes me laugh so much. No one can make me laugh as much as what he does. Sometimes you just have to watch something that makes you smile!